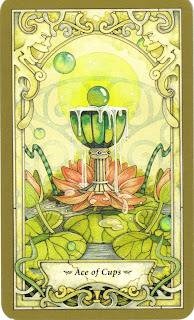 I pulled today's card the Ace of Cups, from The Mystic Faerie Tarot deck by Barbara Moore. The Ace of Cups has to do with deep, overflowing emotions, the start of new emotions, new love, friendship, peace and abundance. It can also symbolize childbirth, pregnancy, motherhood, romance, health and psychic abilities. That certainly runs the gamut. After reading the meaning of this card, what comes to mind for you? Whenever I pull the Ace of Cups, I realize that an entirely new door is opening, one that invites in new feelings, emotions, closeness...and perhaps overwhelm as these new feelings flood in. 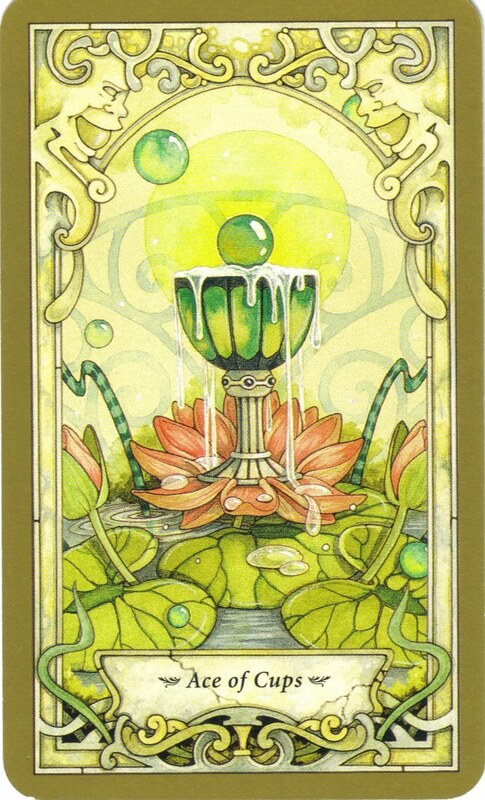 But in most cases, the Ace of Cups has to do with finding joy and pleasure in your life and in your relationships. During this time in between the holidays, open up your heart to your emotions; be in your body and truly experience your life from an emotional standpoint. Open your heart and let your cup overfloweth...with your energy, time, money, etc. The Ace of Cups has to do with love...this can be the love you have for your family, your friends, your work, your pet...and even yourself. Today's mantra is: Feel the love! Knowing that today's card is the Ace of Cups, feel the love all day...when you are waking up, getting ready, working out, eating, working, talking on the phone, looking at the computer, paying your bills, playing with your kids, reading a book, meditating, enjoying someone's company, doing yoga, riding a bike, drinking a cup of coffee...(fill in the blanks here). The message for today is to take the energy of the Ace of Cups and Feel the Love ALL DAY! Ahhhh....feel the love! I do, from family and friends, as I get ready to fly to San Francisco Thursday to celebrate my 73rd birthday on Friday. Thank you, All! I know what I hope it will symbolize for me...another final pregnancy but I have no clue if it will happen. I love the imagery of a cup overflowing. I hope my cup overflowth today. I hope I will be feeling the love. I do sense that no matter what happens, my heart will definitely be involved. I might be working a 'glass ceiling' theme. The idea that I could reach a transparent barrier between me and the bottom edge of joy, and call that happiness. I've wondered if it's possible to "break on through to the other side". This theme has been in my dreams this week. Very interesting. It's not at all difficult for me to decide what this card means to me. I had my first ultrasound today and saw a strong heartbeat, so pregnancy, childbirth, and motherhood, it is! Now that I know she (or he, I guess) is really there, I feel a new outpouring of love for this unique, beautiful being. I can envision her (or him) as a part of our family, and it makes me happy. I've been thinking a lot about being in the moment lately. Being in the moment can be very painful at times, but in numbing out to the moment, I miss out on a lot of joy. I also feel somewhat on the cusp of my "new life" since divorce. Like I am on the edge of all the new relationships and experiences that will come when I can step out of the grief a little more. Mmmmmm....feel the love. How delicious! I love my life so much just the way it is. And if it happened to change in a certain way, I would feel that love, too. Definitely feeling the love today. That's going to be my mantra through the Holiday season "Feel the Love". We have several different extended family members coming for the holidays. I'm going to focus on feeling the love!